The origin of breadsticks dates back to 1679 in Turin Italy. During this time a Baker named Brunero Antonio was faced with the task of developing a bread suitable for the sick child of a king. Through much trial and error, Mr. Antonio developed a crisp, delicate finger of bread that we recognize today as breadsticks. Alessi imported Alessi Garlic Breadsticks are made with the same grissine torinese (Turin style) recipe of centuries ago. We use only the highest quality ingredients in our breadsticks, including Alessi Extra Virgin Olive Oil. 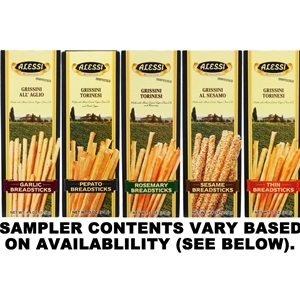 Enjoy Alessi Breadsticks in four different flavors. NOTE: this sampler will only include the items that are currently in stock and may vary from what is pictured (see price and contents below).